Boxes and crates made of structural wood panels are cost-effective in three ways compared to those made of lumber. First, labor for fabrication can be cut by 50 to 75 percent. Second, boxes and crates made of panels are lighter: a 1,000 cubic-foot crate weighs 700 pounds less than the same crate made of lumber. Third, they reduce outside volume: the same crate of 1,000 cubic foot interior capacity is 21 cubic feet smaller than its lumber counterpart. All three factors result in saving money, with no sacrifice in performance. Structural panel boxes and crates are unsurpassed for resisting rough handling, withstanding top loading and providing cargo anchorage. Dozens of species of dimension and board lumber with varying performance characteristics are available. These species have been roughly categorized into four groups specifically for crating purposes, using density as an index of strength. Group 1 contains the least dense woods, Group 4 those of greatest density. Crate fabricators generally use either surfaced or rough lumber in one-inch and two-inch thicknesses, and only rough lumber when thicker than two inches (3x3s, 3x4s, etc.). Consult APA publication Containers and Bins, Form X235, for complete fabrication details. Design data for structural panel crates is based on the individual members of the crate structure working as an integral unit. For example, a particular skid size considered alone may appear too light for the supported load. But the structural panel crate sides, fastened securely to the skids, form the web of a box beam. When the crate is sling-lifted from its ends, this beam carries the load in a simple span. When the crate is forklifted from its center, the beam carries the load in a semi-cantilever. In most crating applications, 3/8-inch panels are adequate. In applications where crates are subjected to exceptionally rough handling, 15/32-inch-thick panels may be necessary. Rack-resistant panels develop their greatest strength when held in the flat plane. If the span exceeds two feet and the panel thickness is 3/8 inch, panels may tend to buckle, decreasing structural rigidity. Struts prevent this buckling. For spans two feet or less, use 3/8-inch panels. For spans between 2 and 4 feet, or crate loads exceeding 10,000 pounds, use 15/32 inch or thicker panels. To prevent the introduction and spread of plant pests, ISPM 15: International Standards for Phytosanitary Measures requires that internationally shipped solid wood pallets be debarked, treated with heat or fumigated with methyl bromide, and marked with a seal of compliance. Engineered wood pallets are exempt from ISPM 15 regulations and do not require debarking, heat treatment or fumigation. This is because the process of manufacturing engineered wood destroys any live organisms in the wood. Wood structural panel containers are available in a variety of sizes and configurations. Collapsible containers, containers with plastic liners for liquids, bag-in-a-box containers, containers with built-in pallets – these can ship everything from heavy machine parts to delicate agricultural products. Plywood and oriented strand board (OSB) are common materials used to make engineered panel containers. Specialty products such as overlaid panels and sanded plywood can also be used when an extra-smooth surface is desired. By joining wood components with simple hardware, manufacturers can match the specifications of a container with the requirements of specific products and materials handling equipment. Plywood is often used for cable reel heads because of its strength, durability and economy. Plywood can be manufactured to different specifications to meet the needs of the cable. For durable cable, unsanded sheathing panels can be used, but for small or delicate wire, touch-sanded panels provide the smooth face necessary. The design of cable reels is generally based on trial-and-error procedures, although most reels are subjected to some in-service testing prior to acceptance. Cut a minimum-depth groove in the head to receive the drum ends. Grooving weakens the critical area of the reel head. Locate bolts or other fasteners as near the same diameter as the drum as possible. The outward spreading force of the contents is resisted by the bolts, and the nearer these can be located to this applied force, the less deflection the heads will develop. Use truss-head bolts, large-flange T-nuts and cup washers to reduce head deflection at the fasteners by providing greater bearing area than conventional bolts. When specifying plywood with one face smooth, orient that face to the inside of the reel. 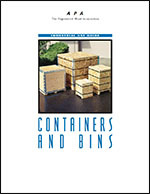 This publication explains how hardware and connection details are critical to bin and container designs. This brochure also includes information about APA bin designs and proprietary containers available from several manufacturers.